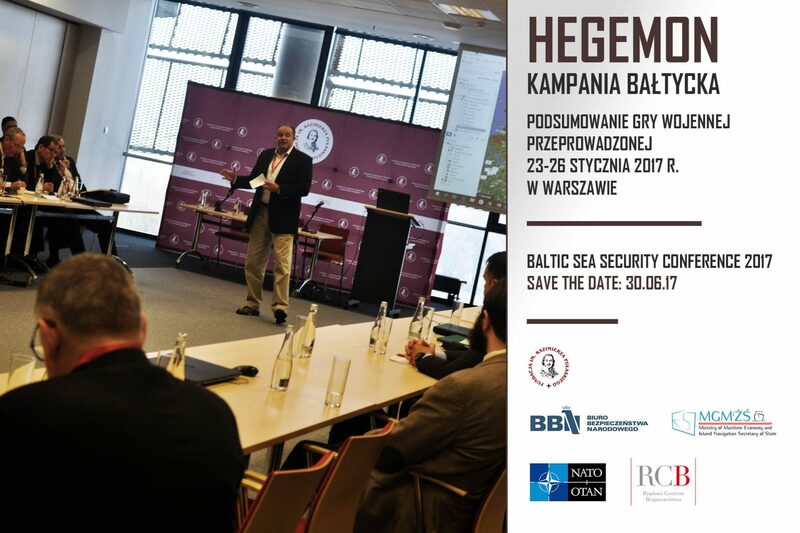 We are glad to inform that the report from the wargaming “Hegemon Baltic Campaign” with participation of Philip M. Breedlove will be presented during the conference Baltic Sea Security 2017 organised by the Casimir Pulaski Foundation. The conference aims at providing a platform for discussion on security and defence cooperation in the Baltic Sea Region. The Pulaski Foundation together with the Potomac Foundation organized the first joint war game “Baltic Security Scenario” based on the computer platform Hegemon. The event took place in Warsaw on 23-26 January 2017. The purpose of the Simulation was to assist in the development of a regional and NATO accepted understanding of the nature of the Russian military threat to the Baltic States and Poland. The Baltic States and Sweden are already employing the HEGEMON Baltic Campaign Simulation to identify force structure and defence planning requirements for defeating Russian General Staff plans for the occupation of the Baltic States and the disintegration of the European Union and NATO. Among the participants of the war game were former Supreme Allied Commander Europe (SACUR) gen. Philip Breedlove, commander of Allied Rapid Reaction Corps, ARRC gen. Tim Radford, generals and commanders from the Nordic countries and representatives of the Polish Armed Forces, military universities, the National Security Bureau and the Ministry of Foreign Affairs. The simulation was performed using the platform and methodology Hegemon. Hegemon uses the interface of Google Earth and contains a complete regional system of battle and the calculation of the destruction for direct fire, indirect air attack and antiaircraft defence. The forces are controlled by players who in each turn give their subordinate units commands to move and attack. All commands are sent to the arbiter, who decides the results of movements and struggle. All commands are issued and executed simultaneously. The conference aims at providing a platform for discussion on security and defence cooperation in the Baltic Sea Region. Recently this area once again has become a place of rivalry between the Western countries and the Russian Federation, which forces the member states of the European Union and NATO to deepen regional cooperation in the security dimension. An important task of the conference will be to assess how to maintain peace and stability in the region as well as to evaluate the potential for cooperation between Armed Forces, especially Navies, and defence industries of the Baltic Sea Region countries. Another issue is an experience sharing. Poland and the Baltic States currently implementing a modernization programme of the Armed Forces. The experience of other NATO countries can be very practical for selecting appropriate solutions. Security of the Baltic Sea region requires a multi-dimensional discussions on both political and military matters. To meet this need the Baltic Sea Security Conference 2017 will be comprised of 4 thematic panels, which will be attended by representatives of Ministries of Foreign Affairs and Defence of the Baltic Sea region states, Armed Forces commanders and representatives of the private sector.